The beleaguered housing industry continued to revive in July, according to the S&P/Case Shiller Home Price Index. 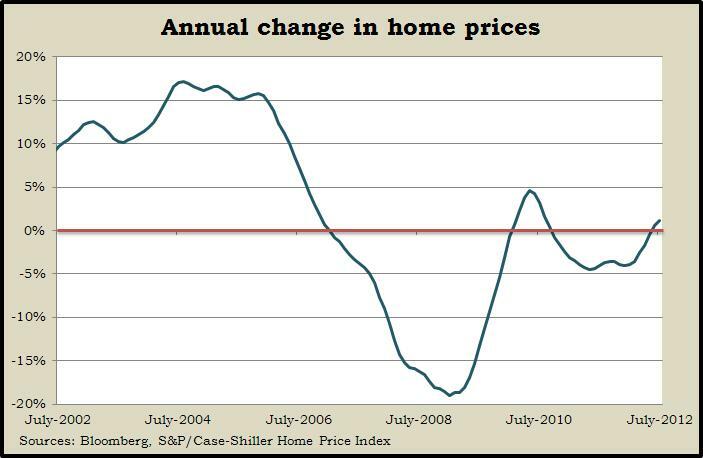 The year-to-year home price rose for the third month in a row on the 20-city composite index. That’s following 19 months of losses. An economist associated with the index expressed increased optimism about housing and noted that improvements in home prices can have a positive influence on consumer confidence. The Conference Board said its consumer confidence index for September rose to its highest point since February, reflecting cheerier assessments of current conditions as well as improved outlooks for the near future. Consumers showed greater confidence in business, employment and personal financial situations. Still, expectations are relatively low, with 16.3% of those surveyed planning on income gains in the next six months. That’s the highest rate so far this year. The annual rate of new-home sales declined slightly in August after reaching a two-year high in July. An even clearer sign that housing is rebounding from its doldrums was that the median sales price grew to $256,900 – the highest since March 2007 and 17% higher than August 2011. The Commerce Department reported the supply of new houses for sale was down 32% from the same time last year, which has helped push prices higher. The U.S. economy grew even less than previously estimated in the second quarter, slowing to an annual rate of 1.3% after growth of 2% in the first quarter and 4.1% in the final quarter of 2011. Drought held back the Gross Domestic Product as farm inventories slowed, the Bureau of Economic Analysis said. Consumer and construction spending weakened from earlier estimates. Corporate profits narrowed to 14.5% year-over-year from a rate of 19.1% in the first quarter. Contracts for home sales fell unexpectedly in August but only slightly from the July pace, which was the most since April 2010. The National Association of Realtors reported that the median sales price rose on a year-to-year basis for the 16th month in a row, in part because of a moderating supply of houses for sale. A huge fall in commercial aircraft orders helped send durable goods orders plunging 13% in August, the biggest drop since the recession. But even aside from volatile transportation makers, orders for manufacturers declined broadly, according to the Commerce Department. It’s another indication of fallout from the global economic slowdown. The four-week moving average of initial unemployment claims dipped for the first time in six weeks. That’s a move in the right direction, but the Labor Department’s weekly gauge of joblessness has changed little for most of 2012. With flagging support from manufacturing, the economy needs a stronger push from consumer spending, but personal income barely budged in August, the Bureau of Economic Analysis said. Adjusted for taxes and inflation, disposable income actually declined in August. Inflation-adjusted personal spending nudged up 0.1% while a key measure of inflation remained at 1.6%, well below the historical average of 2.7% and the Fed target of 2%. Rising values for houses and stocks helped buoy consumer sentiment in September, according to the University of Michigan and Thomson Reuters. Survey respondents expecting better days ahead for the economy outnumbered those with a gloomier outlook by 2-to-1. Researchers said consumers are more likely to get off the dime if they feel they are better off financially than they were before.